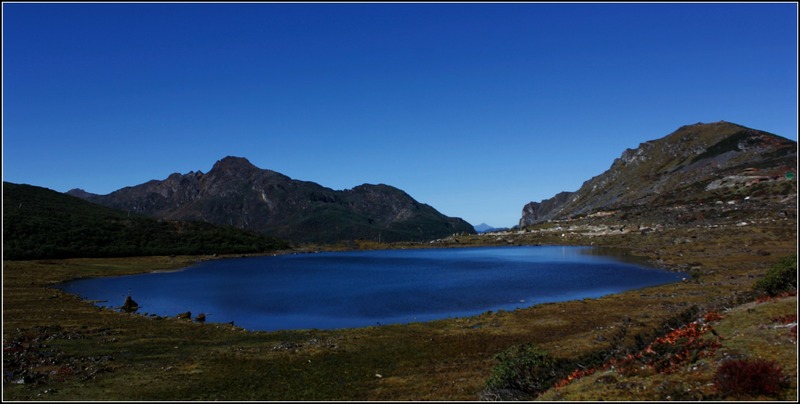 Tawang is dotted with so many picturesque lakes surrounded by mountains. I was told that there were 108 lakes. I am not really sure if anybody counted it or if that was just a favourite local myth. Two of the most famous lakes are Ptso lake and Madhuri /Sangetsar Lake. The lakes are about 40+ Km from the main town of tawang and like in any mountain Km is a bad way to measure a distance, we can say it is about 4 – 5 hrs of drive in the best of road conditions. We were told we need to cross 5 mountains to get there. I was reminded of the childhood story (an Indian fable) of where the magician keeps his life some seven mountains away and the hero sets out on adventurous journey to get that and wondered what adventure the mountains await for me. We set off in our cab as early as 5:30 AM. Our cab guy Rinchin Uncle and his wife were fully prepared with a full tank of petrol, warm clothes, loads of snacks to munch on the way, hot tea, water and lunch. From an altitude of 10,000 ft at Tawang, we touched like 14000 ft with most places on the way were around an altitude of about 12000 ft. It would be better to spend some time acclimatizing in Tawang and would not be advisable to plan for the trip to Ptso and Sangetsar lake the same or next day of reaching Tawang, especially if this is the first time you may be going to places with these altitude. It was late October; the weather was perfect for the ride, just before onset of winter, pleasant yet no snow anywhere. This of course would not be the case during winter, where the roads may be partially or fully blocked. Moving between the mountains gave us a great panoramic view of the mountains and the road was filled with many small falls some of which ran across the road. The road conditions were suitable only for the most experienced and adventurous. We hardly saw any other private vehicles throughout our journey and back. The first stop was the breath taking Ptso lake. It was so beautiful that words can never do justice to its beauty and the lenses struggled to cope up with it. After staring at it long enough with our eyes and cameras, Richin Tashi our local guide and cab driver told us “This is nothing, I’ll show you Madhuri Lake, come” and we were quite intrigued, what in the world could be more beautiful. And after a few more hours we came to this incredible place called the Sangetsar or the Madhuri Lake. The lake was so huge that it spread across 2-3 km in breadth. We were told that the lake was displaced in an earthquake and that’s why were still seeing a lot of pine trees jutting out of the lake. There was another small group who were boating inside the lake and we were told that the boat was theirs all day. There is a beautiful walk path around the lake, and the walk around it had strangely been both a personal and spiritual experience to me, as the encounters with Mother Nature sometimes are in its truest sense. I walked around the lake trying to take its beauty and vastness in my mind as much as in the camera. It sure looked like time had stopped or at least that it didn’t matter. It felt like the most important moment of my life, it felt like I understood life like never before. It felt everything in my life had happened to make that one moment come true. It felt like life was perfect and has always been. No words were spoken, there was silence and there was bliss. Has any place ever made you feel this way? If you were wondering why it was called Madhuri Lake, yes it from Madhuri Dixit. This was the lake in which the song in movie Koyla was shot and hence local people renamed their beloved lake to honor the actress. If you wondered like me why not name it after SRK, apparently lakes are feminine and hence Madhuri and not Sharukh Khan Lake. 1) You can get a taxi from the taxi stand in Tawang for the trip. It would be better to book it atleast a day in advance. There don’t appear to be any govt set rates, So it would be advisable to check with a couple of drivers before finalizing. 2) Start as early as 5:30 and have all your meals including breakfast, lunch and snacks packed, as there are absolutely no shops around and this is no typical tourist place. 3) Since it’s the NE territory adjusting to the IST timings, sun rise is earlier than 5 AM and sunset by 5 PM, and the whole town shuts by 7 PM and is difficult to even get dinner beyond that time. 4) China Border is just a couple of hours away. Indian Citizens may be allowed to go there, by taking extra permissions in the tawang city and requires all documentation about you, your vehicle and your driver if any including photographs with the vehicle. The process requires minimum of a day to complete. 5) For any help any time, you may stop by the army camps and enjoy the hospitality of the Indian Army. Do check with on any road blocks and most favourable route on the way. 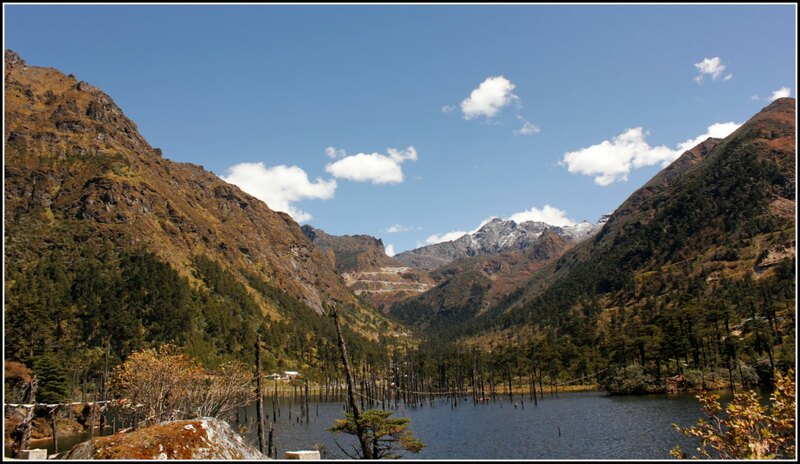 6) No permissions are required for travelling upto Madhuri Lake apart from the Arunachal permit for Tawang, which would be checked at the entry of Arunachal Pradesh itself, in this case Bhalukpong. 1) It’s a difficult terrain. Not advisable for the two wheelers or for any vehicles at all during the winter, except the trained truck drivers of the Indian Army. 2) If possible hire a Jeep or any 4Wheel drive vehicle. 3) Start at the earliest possible time and try to be back by sunset. 4) Carry all the food required for the day for the entire group. 5) Carry additional warm clothes as it may get colder higher above.